In this fourth installment of Alice Kimberly's "Ghost" series, dead-man ghost Jack Shepard and bookshop-owner Penelope McClure solve a mystery involving film noir star Hedda Geist, who is back in the lime-light after years of being nearly forgotten. Hedda is in town for the grand opening and restoration of an old-tyme movie theater. When Hedda is close to being killed from an accident, other guest characters begin to die, so of course Penelope and Jack must figure out the identity of the killer. This particular novel just doesn't have the "it" factor compared to its predecessors in the series. The mystery surrounding the film noir aspect is slow-paced and boring, and I really struggled with it. The story isn't intriguing or as glamorous as it should seem, and we don't warm up to any of the guest characters. 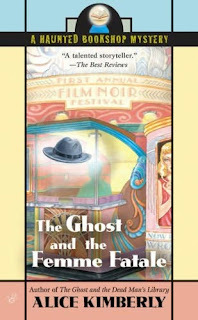 The BEST parts of The Ghost and the Femme Fatale are when Jack takes Penelope on sleuthing adventures within her dreams. Jack continues to be such a romantic and tough-guy character, and I'm sure all readers wish he was alive and well in Penelope's time! However, if this were the case, there would be no series. By the time we are exposed to the killer's identity in the end, it just doesn't matter, because the entire experience is just dull. I'm still a fan though, and I've got the next book in the series on standby!